With genkan say goodbye to key management…forever! genkan and KABA present the ORACODE 660 locking system exclusively for genkan property management software users. Smart technology ! The Kaba Oracode 660 Keyless Lock System from ILCO is an excellent way for rental property managers to manage the security of the owners property via the internet using genkan. The Kaba Oracode access systems are electronic push-button keyless door locks, with each user being assigned a time-sensitive traceable code. 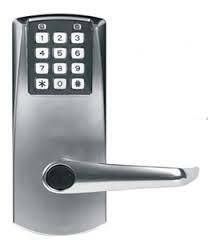 The Kaba Locking solutions system is an efficient, secure, effective and economical access solutions. This unique keyless and cardless system is an electronic pin based lock that grants access through a time sensitive code. The Oracode lock is the centre piece of a system consisting of a simple web based software package and a maintenance unit to program and audit the locks. Access can be granted from anywhere in the world with genkan, as soon as the guest is confirmed genkan queries the KABA server for a unique door code. genkan then by SMS sends the client at a specific time of arrival their unique secure code. There is no need to store or distribute key or keycards to guests, staff or vendors. Access management becomes a breeze.